For Such a Time as This is the Inaugural General Meeting of the Pacific Mountain Regional Council (it used to be called BC Conference, or Conference). It runs from Thursday May 30 – Sunday June 2, 2019 at the Langley Events Centre, in Langley BC. We are gathering with acknowledgement and respect, as guests on the traditional territory of the Kwantlen First Nation. From Whitehorse in the North, to the coastal islands on the West, to the mountain town of Banff in the East, and across all hills and valleys, watersheds and plains across our Region, United Church people of all ages will gather the 2019 General Meeting of the Pacific Mountain Region. Some people will be there as delegates and leaders, others will be there as volunteers, visitors and observers – and some will be there as participants and leaders of the Children’s Program and the Youth Program! The age-specific Children and Youth Program at the General Meeting provide the opportunity for up fifty-five children and youth, ages 8 – 18, from across our Pacific Mountain Region to gather, build a welcoming and inclusive community, practice being followers of Jesus, and learn about the governance of our United Church. We are so excited to continue the powerful tradition of making space for the youngest generations in our church. Congregations, Communities of Faith, and Leaders are warmly invited to distribute this information to the 8-18 year olds in your setting, and encourage them to join you in the General Meeting experience. Specific arrival and departure details will come once participation is confirmed. Please read on for the Children’s and Youth Program details, including how to apply to attend. Children will explore this year’s theme “For Such a Time as This” through story, drama, art, games, and reflection. They will join with the whole gathering of the General Meeting from time to time to take part in the tasks being worked on, and to participate in and offer leadership in worship. The two groups of youth will explore this year’s theme “For Such a Time as This” in a variety different ways such as discussion, artistic expression, games, and spiritual practices. We will join with the whole gathering of the General Meeting from time to time to take part in the tasks being worked on, and to participate in and offer leadership in worship, as well as for some shared meals. We will visit some local sights in Langley and have some recreational time together. The Children’s Program is for people 8-12 years old. There are thirty spots in the Children’s Program. The Youth Program is for people 13-18 years old. In the Youth Program there are fifteen spots for people ages 12-15, and ten spots for people ages 16-18. If we receive more than registrations than space allows, consideration will be given first to children who have not yet attended a General Meeting. Different from past Youth at Conference and Youth at Presbytery events, there are no longer elected youth voting members from Presbyteries under the new church structure. There are no restrictions on numbers of youth who may attend based on location within the Region. We get to reinvent ourselves and how we do things! 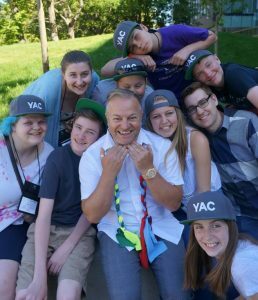 Children and Youth Program participants don’t need to be formal members of the church, baptized or confirmed to apply or attend, and your congregation doesn’t need to have formal children or youth ministry in order to bring young people from your setting to the General Meeting. All participants attending the Children’s Program must be accompanied to the General Meeting by an adult Delegate to the General Meeting. The adult Delegate can be the child’s parent, or a sponsor. The adult Delegate is prepared to take overall responsibility for the child during the General Meeting. All participants attending the Youth Program must have a participation agreement signed by a parent or guardian. The Children and Youth Programs are sleep over programs. Both will be staying overnight at the United Churches of Langely, Murrayville site. Regional Children and Youth Staff, and screened volunteer staff, will be onsite with the children and youth, providing supervision overnight. Children with parents attending the General Meeting are welcome to chose to have their children stay with them rather than sleep over at the church. Travel costs and details are the responsibility of the churches and/or families of the children and youth attending the Children’s Program and Youth Program. We encourage congregations to support their young people by dedicating fund to Children & Youth at the General Meeting, including registration fees and travel expenses. Once your application has been approved, the Children’s Program and Youth Program Staff will be in direct contact with each confirmed participant to help facilitate the final two steps required for attending (1.Registering for the General Meeting, 2. Completing Parent/Guardian permission forms and waivers).